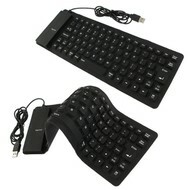 USB Flexible Waterproof Keyboard - NWCA Inc. This multimedia flexible keyboard makes your web surfing a breeze. You can open email, or calculator with just one touch. Lightweight, slim, and compact, this keyboard is perfect for travel, school, or any work environment. It fits easily in your briefcase or backpack. 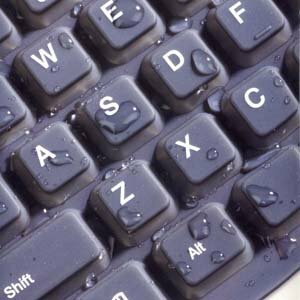 The keyboard can be clearned with water, alcohole or disinfectant to help prevent the spread of the disease and germs. It is suitable for public place use such as school, restaurant, or hospital where clean keybord is a requirement. 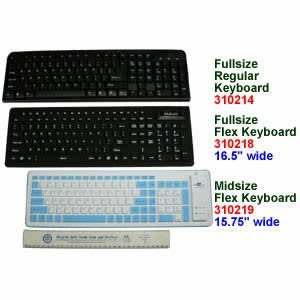 This sealed keyboard can be easily cleaned, also good for use in dusty area such as factory, or ougtdoor. Quiet keystroke is a good match for library use. Available in black or blue color. To use with PS2 machines, use 150533 (USB/PS2 adapter (sold seperately). * Oeration temperature is -20C- +60C.